Two recent developments highlight some of the interesting relationships between international criminal justice institutions and national legal systems. Yesterday, a Dutch Court ruled that three witnesses who had travelled to The Hague to testify in the Katanga trial have the right to apply for refugee status in the Netherlands. The ruling reverses an earlier decision made by the Dutch Immigration and Naturalization Service but confirms decisions issued by the Trial Chamber of the International Criminal Court released a few months ago and discussed on this blog. Meanwhile, in Paris, the French government has refused to cooperate with the International Criminal Tribunal for the former Yugoslavia in its attempts to arrest Florence Hartmann, who has been convicted of contempt of court. The French authorities took the view that they are required by virtue of the Security Council resolution to cooperate in apprehending persons suspected of committing international crimes but that they have no duty as regards administrative matters like contempt. As permanent members of the Security Council and therefore godfathers of the Tribunal, I suppose they ought to know. According to the New York Times, a spokesman for the Foreign Ministry in Paris, said that it would be impossible for France to fulfill the request because judicial agreements between France and the Tribunal do not apply to offenses sich as contempt of court. What is the next step? I suppose the Tribunal should report France to the Security Council for non-compliance. I wonder what will happen then. Pre-Trial Chamber I of the International Criminal Court issued a ruling earlier this week that has the consequence of stripping Obama, Medvedev and Hu Jintao of their immunity before the Court. This would mean, for example, that charges could be introduced against President Obama for the conduct of US forces in Afghanistan (which is a State Party to the Rome Statute) in the same way as they have been introduced against President Bashir for the conduct of Sudanese forces in Darfur (where jurisdiction results from a Security Council). The decision does not of course mention Obama, Medvedev and Hu Jintao. It concerns the possible immunity of President Bashir. Over seven pages, in a decision condemning Malawi for its failure to arrest Bashir, the Pre-Trial Chamber reviews a number of authorities. The decision reads like a lawyer’s brief, in that it is entirely one-sided. The Chamber does not address the difficulties or the arguments that go against its position. This is regrettable, but perhaps to be expected when it is a decision is issued in the absence of representations from the defence. Can it be a wise practice for the Pre-Trial Chamber to attempt to address serious and difficult matters of international law in the absence of detailed argument. Under such circumstances, shouldn’t a Chamber at least make an effort to confront the inconvenient arguments that stand in its way. For example, it reaches the rather trite conclusion that there can be no immunity of a head of state before an ‘international tribunal’. But nowhere does it define an international tribunal or suggest how one is to be identified. It may well be that there are various types of international tribunal, and that rules of immunity apply differently depending upon the type of tribunal. In the famous Arrest Warrant case, the International Court of Justice said that immunity would not be available before ‘certain international criminal courts, where they have jurisdiction’. By implication, the International Court of Justice was saying that immunity would remain before ‘certain international criminal courts’. The Pre-Trial Chamber’s statement is much more absolute. The issue of immunity was already addressed by the Pre-Trial Chamber that issued the arrest warrant against Bashir in March 2009. It is not apparent why this differently constituted Pre-Trial Chamber felt compelled to issue a new opinion, presenting the matter somewhat differently. Perhaps, in another year, yet another Pre-Trial Chamber, with different members, will issue yet another ex parte decision on the matter. The legal argument of the Pre-Trial Chamber this time around is not very compelling. It cites authority from the 1919 Commission on Responsibilities but without noting that this was not the position taken by the Paris Peace Conference and is not reflected in the Treaty of Versailles. The Treaty of Versailles does indeed propose to try the German Emperor, in art. 227, but with the consent of Germany. That is why it is in the Treaty. If Germany’s consent were no required for the victors to try its head of state, then the proposed international tribunal would have been found in a separate agreement between the victors alone. Then the Pre-Trial Chamber turns to the post-second world war tribunals. The citations do not refer to the issue of head of state immunity but rather to the defence of official capacity. There is a distinction. This can be seen in the Rome Statute itself, where article 27(1) deals with official capacity and article 27(2) deals with immunity. I could go on. This is a complicated question. Much has been written. The Chamber does not refer to any of the thoughtful academic contributions on this subject, by scholars like Dapo Akande and Paola Gaeta. There is an argument – although it is not without its own problems – by which there is no immunity for the likes of Bashir before the International Criminal Court because this is implied by the Security Council resolution referring Sudan to the Court. That, at least, is a more nuanced and subtle proposition. It would mean that Obama, Medvedev and Hu would continue to enjoy immunity from the Court except in the unlikely event of a Security Council referral that concerned them. In the final sentence of its opinion, the Pre-Trial Chamber notes that jurisdiction results from a Security Council referral, but it does not indicate why this might be significant. But the Pre-Trial Chamber has gone much further in this recent ruling. Indeed, it seems to take the position that there is no immunity given that the International Criminal Court is an international tribunal. Presumably therefore article 27(2) is entirely superfluous. Authority cited by the Pre-Trial Chamber includes some simplistic rulings from the ad hoc tribunals. But the ad hoc tribunals can claim to have been the offspring of the Security Council. Immunity would not be applicable there because the Tribunal is not created by a State but rather by the international community acting collectively. The reason that the same analysis cannot apply to the International Criminal Court is that it is created by the 120 States Parties. The International Criminal Court is a treaty-based court. In principle, the Rome Statute can only bind member states. Article 27(2) removes immunities from heads of state. This only applies to heads of state of States Parties and cannot be invoked against heads of state of non-party States. Some will argue that with 120 States Parties, the Court has reached a critical mass whereby it can really claim a degree of universality. This is not too convincing an argument either. The Court may have more than half the States in the world, but it does not represent half the population of the world. Vanuatu (population 250,000), the latest State to join the Court, did not make much impact in this respect. If there is no immunity before any international criminal court, as the Pre-Trial Chamber seems to hold, would it be possible for Nauru, Monaco, Andorra, Taiwan and the Palestinian Authority to join together and create an international criminal tribunal where the President of the United States would be stripped of the immunity that he would otherwise possess before the national courts of those countries? The immunity of heads of states results from customary international law. They cannot be deprived of it because other States so decide, whether they do this by their domestic law or by treaty. It is precisely for that reason that article 27(2) was included in the Statute. In the absence of article 27(2), even States Parties would be able to invoke immunity. It would be very interesting to hear the position of the United States, Russia and China on this point, because it concerns them and their heads of State. In the 2005 report on Darfur, the late Antonio Cassese suggested that rulings by international criminal tribunals on points of law that are not subsequently contested by States may become accepted as custom. So it might be useful for the big powers that have not joined the Court to make their views on this known. I suspect that they agree with Bashir, and not with the Pre-Trial Chamber. For more on this, see also Dov Jacob's blog. English-language abstracts of no more than 300 words, plus CV, should be submitted no later than Friday 13 January 2012, to jpb@cdh.leidenuniv.nl. From left, Ludo Hennebel, Wibke Timmermann, myself and Kathleen Cavanaugh. 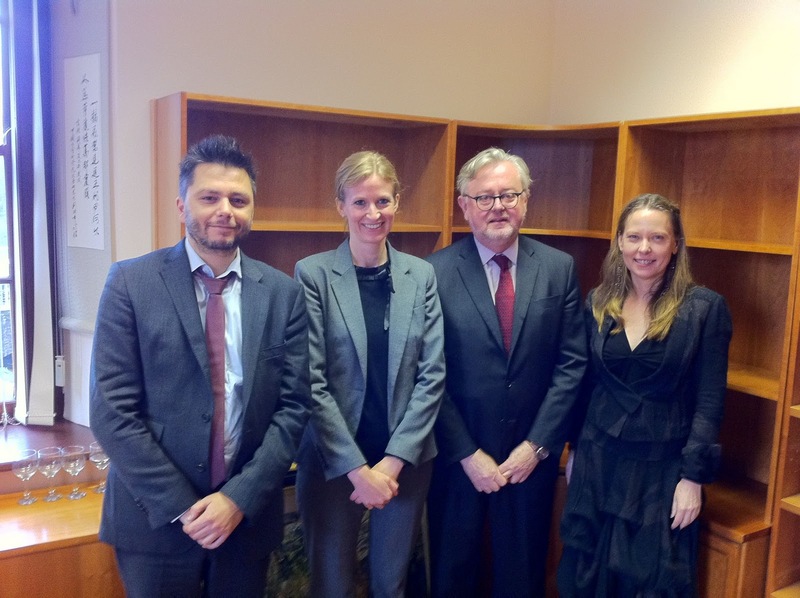 Wibke Timmermann successfully defended her doctoral thesis in Galway on Monday. The thesis is entitled: 'Hate Speech and Incitmement in International Criminal Law'. Dr Ludovic Hennebel, of the Centre Perelman de Philosophie du Droit at the Université Libre de Bruxelles was the internal examiner, and Dr Kathleen Cavanaugh was the internal examiner. Congratulations, Wibke, on this great acheivement. 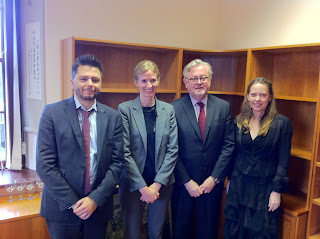 I believe this is the tenth doctorate completed successfully at the Irish Centre for Human Rights in 2011. New Warrant for Darfur, but Where is the Genocide Charge? Where is the genocide charge? In the case of President Bashir, the Prosecutor went on appeal when the Pre-Trial Chamber refused to authorize a charge of genocide. I have heard him lecture about ‘the ongoing genocide by attrition’ that continued until 2008 or 2009. For all I know, the Prosecutor thinks that genocide is still going on. How is it that there is an ongoing genocide but that the Minister of Defence does not seem to be involved? After all, the charges against Bashir were essentially based on the idea that as President of the country, he was responsible for the attacks. So why are the attacks genocidal for Bashir but not for Hussein? The whole business smacks of incoherence. When he applied for the arrest warrant against Bashir, the Prosecutor spoke of Bashir’s orders to commit genocidfe, and said: ‘The attacks on villages across Darfur from March 2003 to the present were designed to kill members of the targeted groups and force the survivors from their lands, but also to destroy the very means of survival of the groups as such as described in paragraph 15 above.’ Aren’t these the facts that Hussein is charged with too? I would make another observation about the recent statement by the Office of the Prosecutor. I do not think that Pre-Trial Chamber I ‘ruled that Local Security Committees coordinated these attacks’. All that the Pre-Trial Chamber did was confirm that there were ‘reasonable grounds’ for the Prosecutor’s allegations, which is not at all the same thing. It is a big mistake to describe such rulings of a Pre-Trial Chamber, made ex parte (that is, without hearing the defence) and on the basis of unchallenged evidence, a ruling on a factual issue. Those who write the press releases in the Office of the Prosecutor might exercise a bit more caution. I’m just back from a visit to China where I participated in an important seminar on reform of the death penalty. It was jointly sponsored by the Chinese Ministry of Foreign Affairs and the Office of the High Commissioner for Human Rights. There were about 30 people in attendance, including the leading specialists on the subject in China from the universities, the National People’s Congress, the Supreme People’s Court, prosecutors and defence counsel. The United Nations brought three experts, Roger Hood of Oxford University, Hans-Jörg Albrecht of the Max Planck Institute and myself. One after another, the Chinese specialists took the floor to affirm their commitment to the reform and the eventual abolition of the death penalty. We discussed many of the features of the imposition of capital punishment in China. There have been some significant reforms in death penalty practice in recent years. In 2007, review of death sentences by higher courts became mandatory. In 2011, 13 crimes for which the death penalty could be imposed were repealed, and a prohibition on executing persons over 75 was adopted. Notoriously, China does not issue statistics on the number of executions that are carried out. We have been told over and over again that this is a ‘state secret’. Frustrated by this unacceptable situation, Amnesty International has decided to stop even speculating on the number of executions. It says simply that China’s executions number in ‘thousands’, and that China accounts for more death sentences than the rest of the world put together. Nevertheless, our interlocutors at the seminar insisted that the total number of death sentences has dropped as a result of the 2007 reforms by approximately 50%. If that is true – and I have no reason to doubt what the Chinese scholars tell us – then China has made very significant progress in recent years. We were also told that the Supreme People’s Court now grants about 10% of the death penalty appeals that it hears. That figure is not inconsistent with the 50% reduction, and probably reflects the fact that the more questionable death sentences are now eliminated by the lower courts before they even get to the highest appellate level. The repeal of the death penalty provisions for 13 crimes earlier this year seemed to concern rather obscure offences, and my impression is that this did not contribute in a very significant way to reducing the overall volume of capital sentences. However, it was cited as something of symbolic importance. There was broad agreement at the seminar that further progress needs to be made, and that in the short to medium term China should cease executions for all non-violent crimes. I have no idea what percentage of the current executions concern drug trafficking or corruption, and what percentage is reserved for murder. An emphasis was placed on developing means by which the death penalty can be reduced through judicial intervention, this being a more promising approach than legislative reform. That makes sense, and is consistent with what has taken place in many countries in Europe and elsewhere that have moved towards abolition in recent decades. The overall message is one of a commitment to reform, and that is a very good thing. That it is situated within a perspective of full abolition is also extremely positive and encouraging. The information is inadequate and the statistics are lacking. Despite this, the information that we do get indicates that there has been much improvement. It is important to recognize this and to encourage further change. In my concluding comments at the seminar, I suggested that China might find a way to express its evolving view on the death penalty by abstaining when the bi-annual resolution on capital punishment comes before the United Nations General Assembly next November. This positive assessment is not meant to suggest that a huge amount does not remain to be done (nor to imply that China does not have other serious human rights problems). As a reform measure, China should eliminate capital punishment for all crimes but murder. It should record and publish statistics, not only to satisfy international curiosity but in order to inform the research and the ongoing debate within China. Research on the subject is still very rudimentary. This is not helped by the fact that the numbers are kept secret. In other countries where the death penalty remains in force, like the United States, reform is driven by the vigilant work of dedicated defense counsel and a robust civil society. Although there are some very committed lawyers who work in the area in China, there is no real comparison with what happens in the United States. And civil society in the form of NGOs is not very visible at all in China. The main forum for debates, it would seem, takes the form of conferences and seminars like the one held last week. Monitoring the status of capital punishment is very much an exercise in observing trends and estimating their extent. The United Nations itself has been rather conservative, and little more than twenty years ago it still seemed to doubt that there was a clear momentum towards global abolition. China’s behaviour in recent years reflects the global trend among states that retain capital punishment towards very significant reduction in its extent. There are only a few exceptions, of which Iran is the main one. If it is true that China has cut back its executions by 50% in recent years, then that is a more dramatic reduction than if every other state in the world that imposes capital punishment were to abolish the practice!